This is part 3 of a 7-part account of my trip to Peninsular Malaysia and Borneo in January/February, 2017. After the two nights of lowlands close to Kuala Lumpur, our next destination was a little farther away and at a higher elevation: the Genting Highlands, where we stayed for two days and nights. 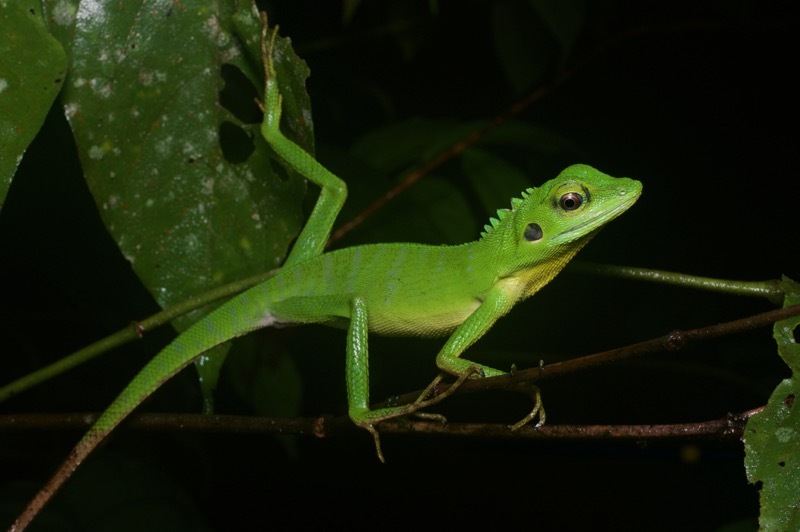 Being significantly cooler, the highland areas in Peninsular Malaysia have much less herp diversity than the lowlands, but they are definitely worth visiting because they are home to a good number of endemic species. In keeping with the general weather patterns of my trip, the Genting Highlands were rainy, cold, and windy during most of our stay. Even the invertebrates mostly hid from the elements. 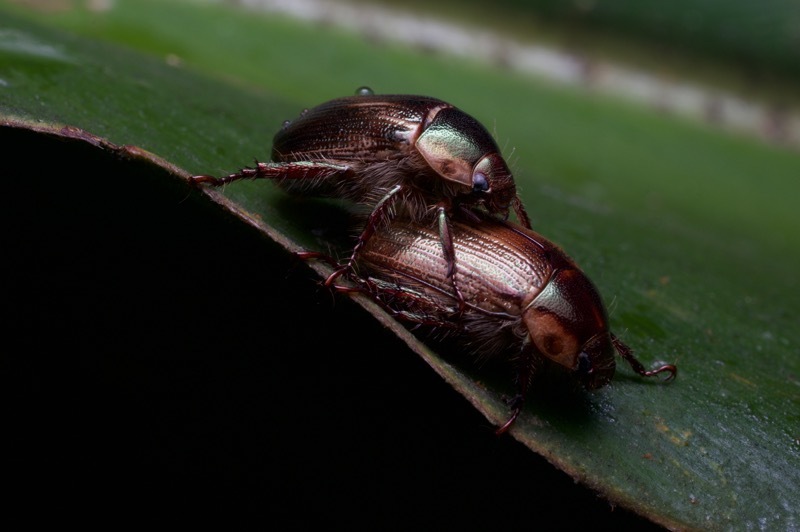 This pair of beetles made their own heat, it seems. 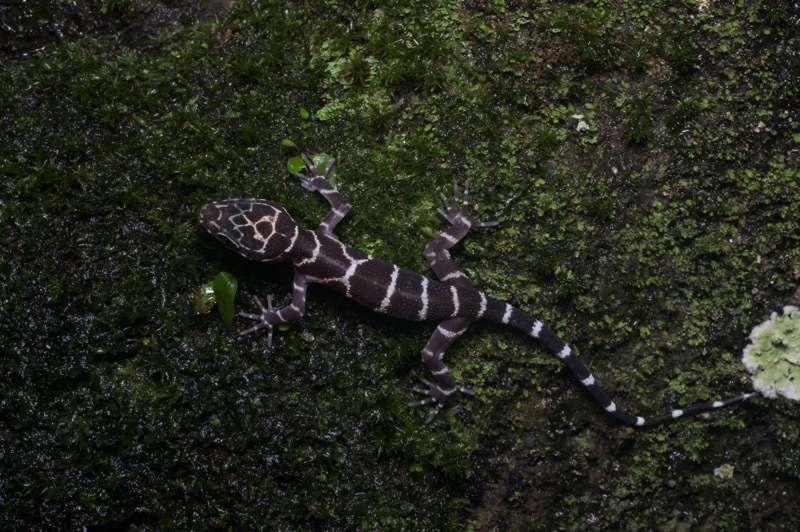 We saw only a handful of herp species way up high on two nights, but they were all new to me. 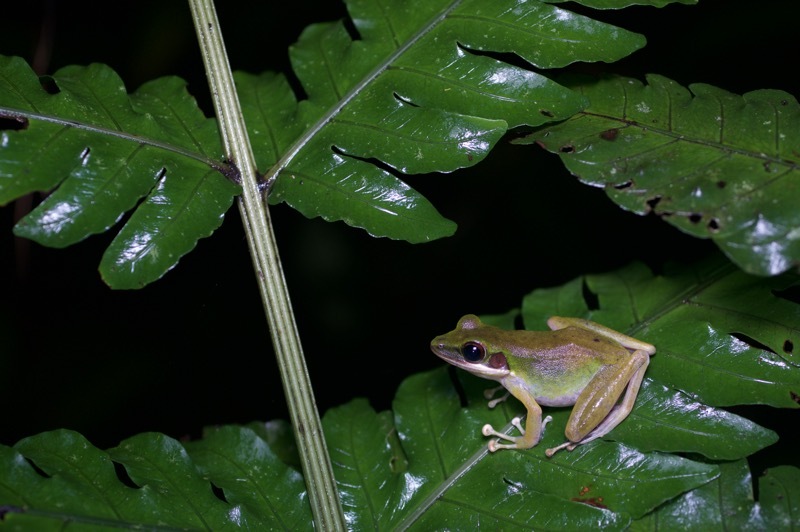 First up was flying frog species #4 for this trip. The only other frogs we saw in the wind and rain were these two itty-bitty microhylids. What looked like a completely generic house gecko turned out to be a little more interesting. 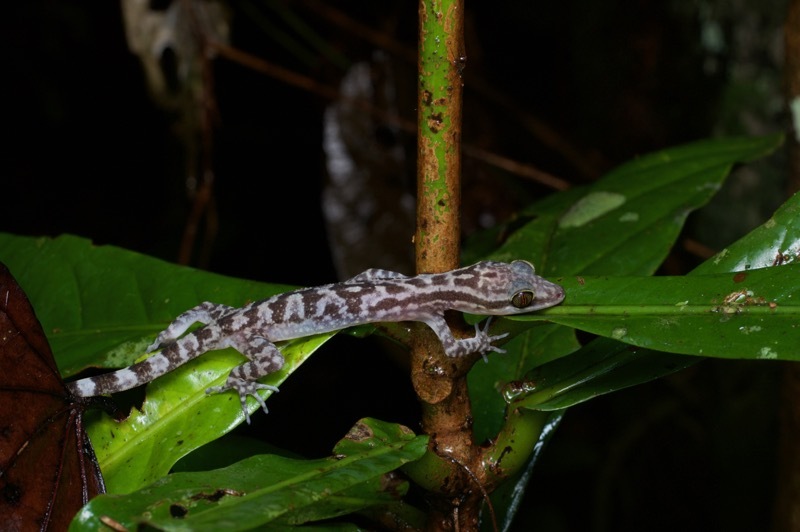 This was a Tititwangsa Slender Gecko (Hemiphyllodactylus titiwangsaensis) in 2012 when Grismer published his huge and wonderful book "Lizards of Peninsular Malaysia, Singapore, and their Adjacent Archipelagos". 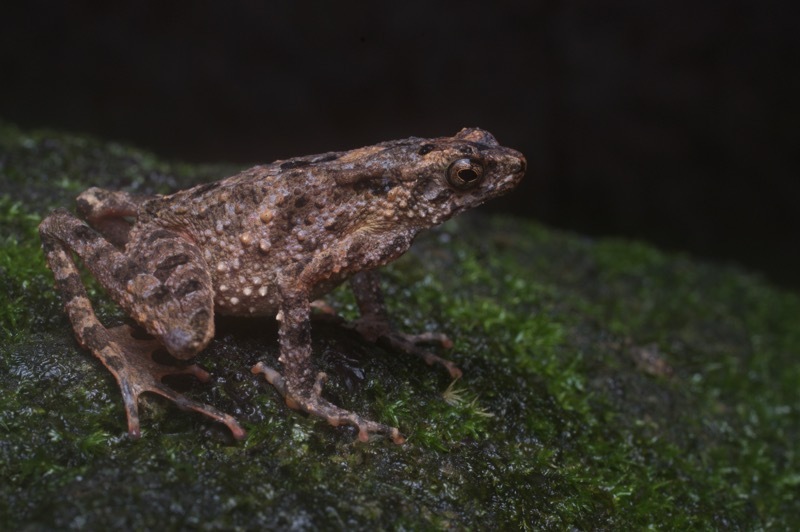 But in 2013 the species was declared (by Grismer et al) a species complex, and this became an as-yet-undescribed species. One of many reasons why Grismer is working on a second edition. The find of the night was this sleeping agamid with unusually large and sloppily arranged scales. 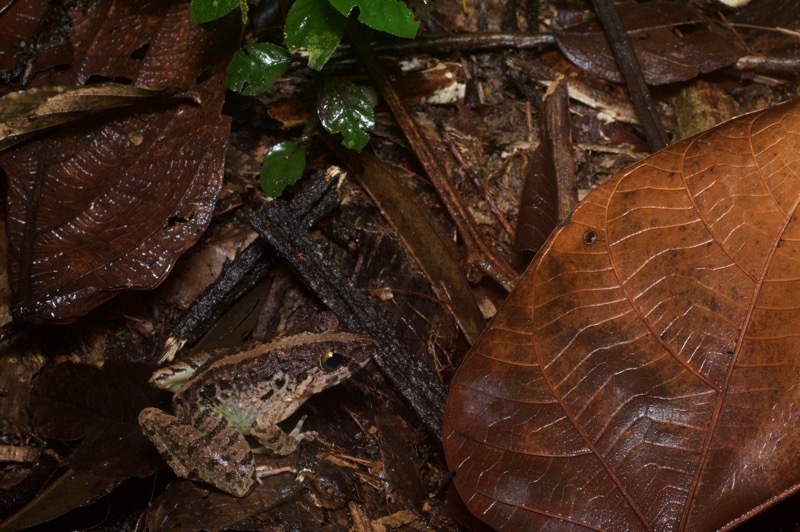 This species was only described in 2016 from a few specimens, all found in the same very small area. I found it, but didn't know what it was. 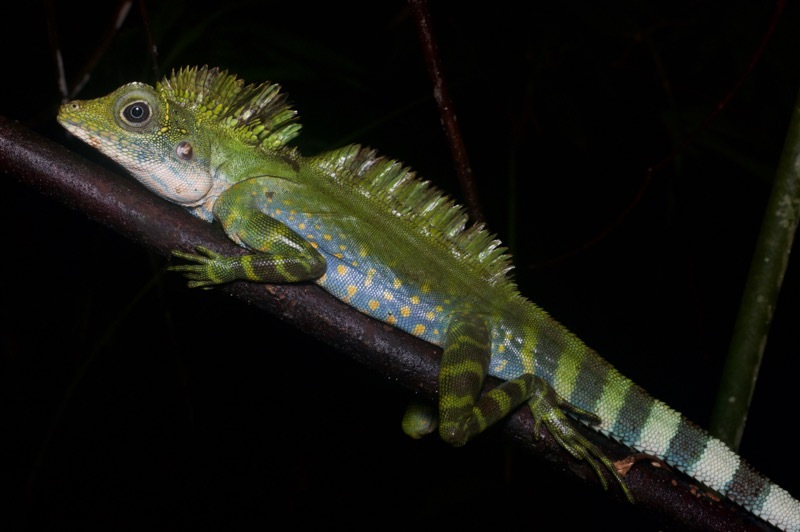 Kurt recognized it right away because his photos had been used by Grismer et al in the paper that described this species. The cold, wet, and windy weather conditions each night atop the Genting Highlands discouraged us from spending too much time there, which meant we still had a goodly hunk of nighttime available. So each night we started at the highest of the highlands, then drove down to a significantly lower-elevation spot by a river in nearby Batang Kali. Unsurprisingly, bugs thrived in the lowland forest. I will only inflict upon you the one with the most charming name. 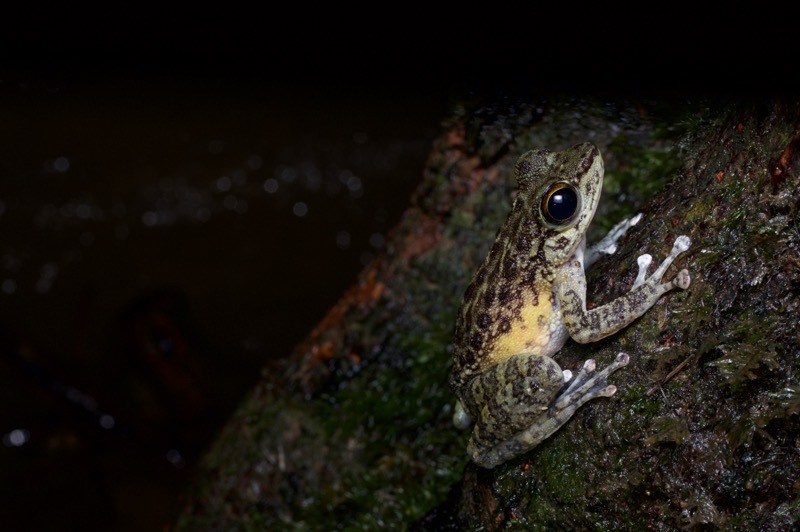 Most of the frogs in the lowlands had already shown up in Semenyih and/or Ulu Yam. 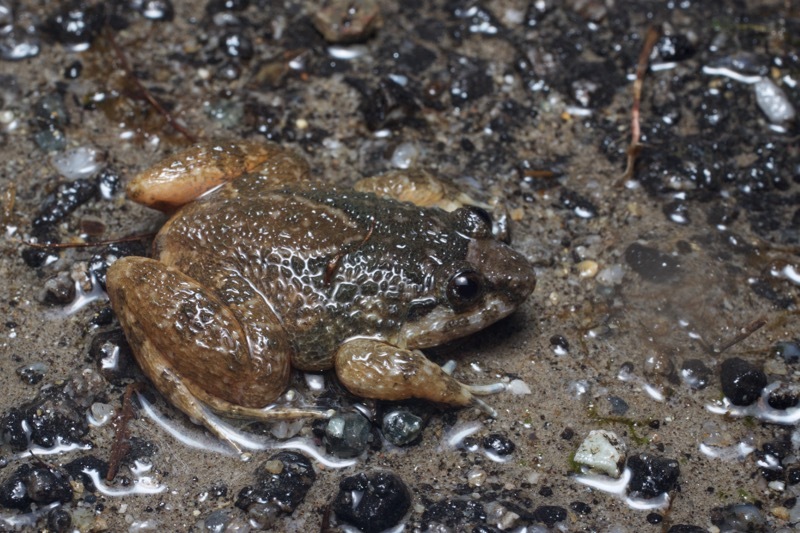 For instance, both of the common large terrestrial forest frogs were familiar to me, though I wasn't confident about distinguishing them in the field. Armed with photos and indefinite time, I think I have these right now. 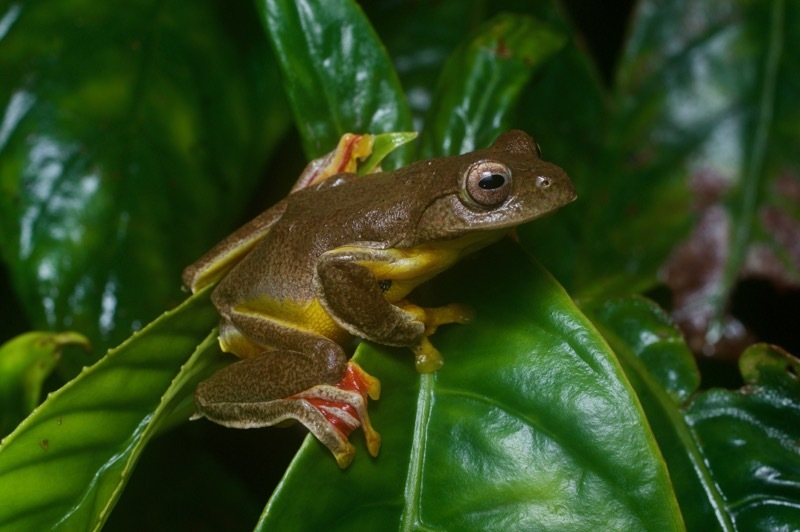 White-lipped Frogs were common in all the lowland spots I visited in Peninsular Malaysia. And since this lowland location included a large fast-moving stream, it also included my favorite boulder-clinging fast-moving-stream-loving frog. 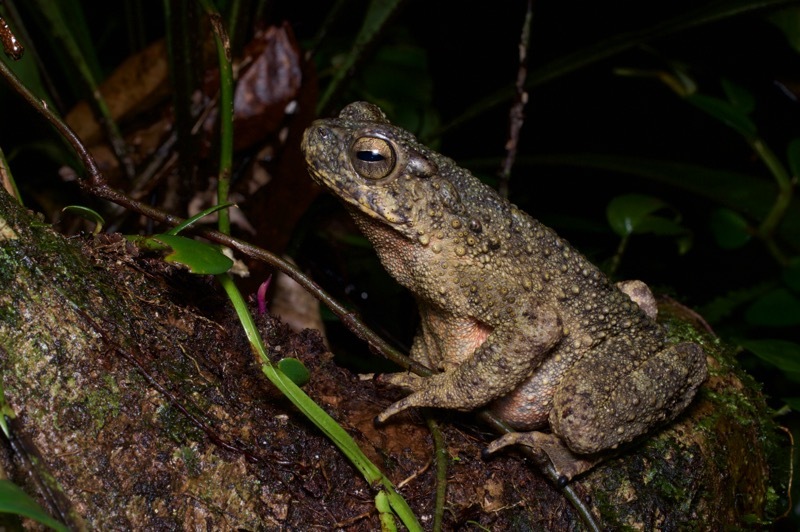 The toad population was different here than at Semenyih and Ulu Yam. In those places almost all the toads were Lesser Stream Toads. Here they were almost all the much larger River Toads. However, not all of the much larger River Toads were actually larger; here's a little baby, small enough that you might think it was a young Lesser Stream Toad if you didn't look carefully enough. Here's a properly massive River Toad that Kurt spotted from far away via its eyeshine. For size reference, here is the same toad (or was it just a toad statue?) with Kurt's hand. 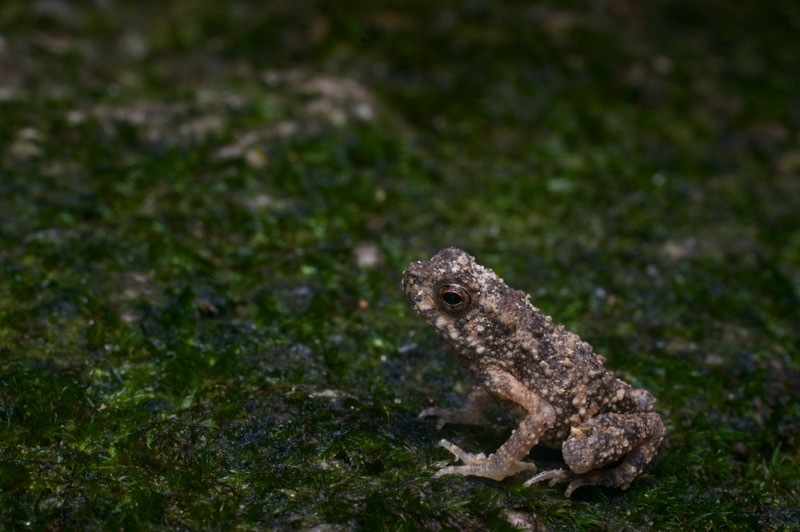 I found one small toad posing nicely up on a large mossy boulder high above the stream. It looked different to me than any of the other toads we had seen so far, with its relatively small head and long back legs with huge feet. Kurt thought it was a Lesser Stream Toad but I wasn't convinced. 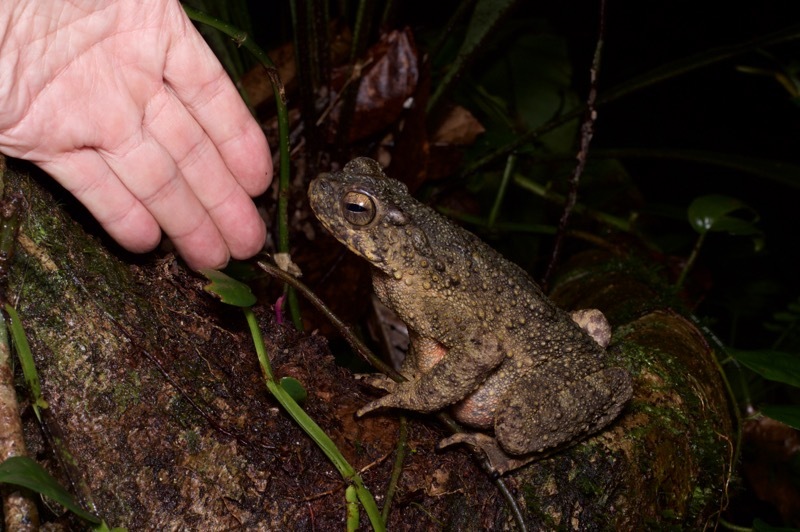 When I was back at my hotel later, I looked up the local toad candidates and concluded that it had been a new-to-me species, the Cross Toad. Quite surprisingly, this was also a new-to-Kurt species, so for a short time (perhaps already over?) 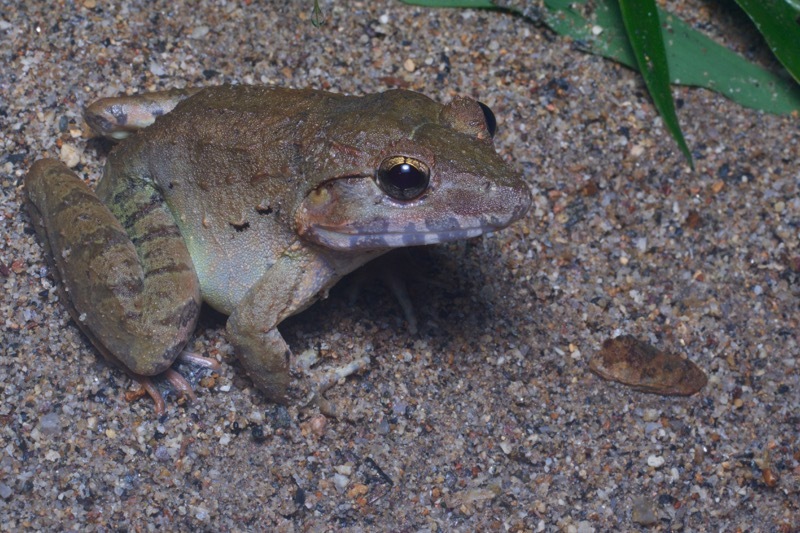 a Peninsular Malaysian herp has been photographed by me but not by Kurt. This is my new claim to fame. I believe the strange texture of this frog identifies it as a Corrugated Frog. This one was actually found higher up the hill on a roadside on which we spent only a few minutes due to the sudden arrival of a cloudburst. 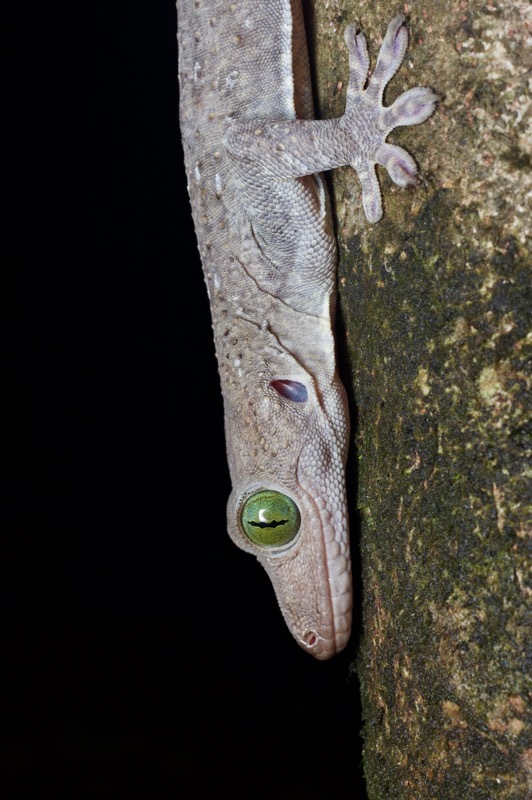 Back down the hill at Batang Kali, we saw a few more earless agamids sleeping in the forest at night. 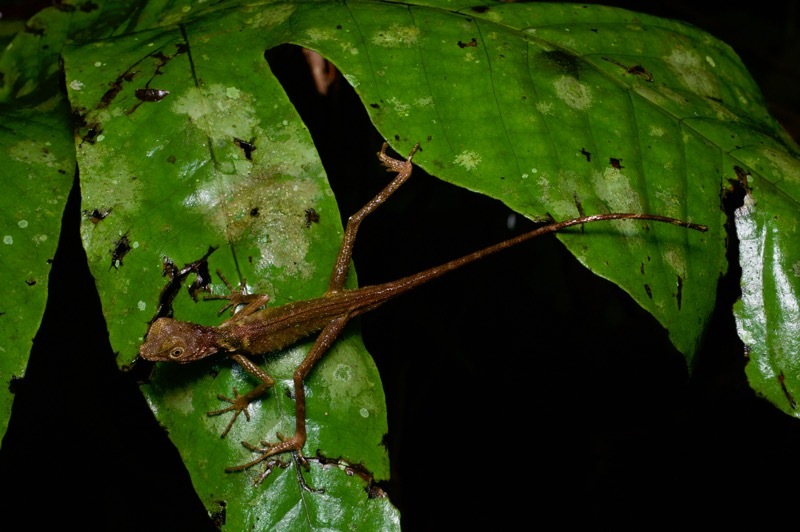 Like many rainforest leaves, this little teeny lizard has its very own "drip tip" at the end of its tail. Here's an adult of the same species. This one was sleeping in a basically linear position until I startled it with my photo-taking, at which point it jumped down to a lower leaf and held this dramatic pose. On our first night, in Semenyih, we had seen one Green Crested Lizard, but it was high up and a long way away, too far to get even a halfway decent photo. (It would have been lifer #23 on that first night but I didn't even count it since I didn't get a photo and I was confident that I'd see another one later.) Since then we had expected to see more of these common lizards at every lowland location, but had struck out until our second night at Batang Kali, when my flashlight reflected off this beautiful fellow. 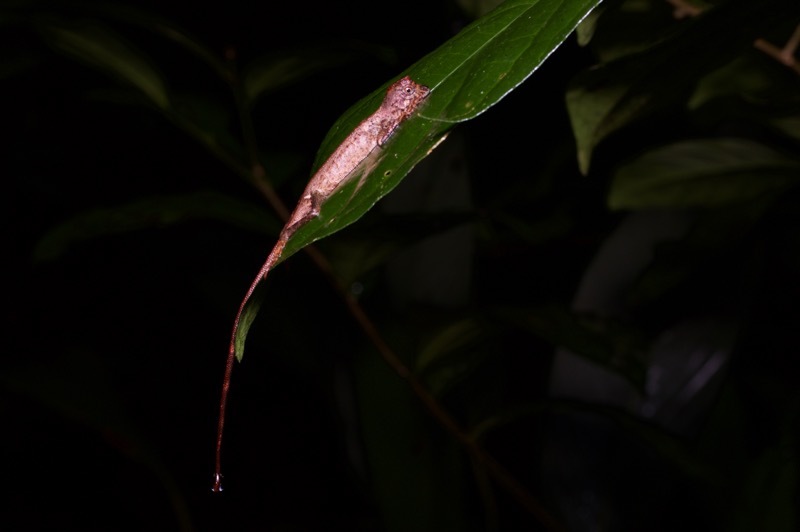 No matter how many times you see them, arboreal sleeping forest lizards just don't get any better than this. 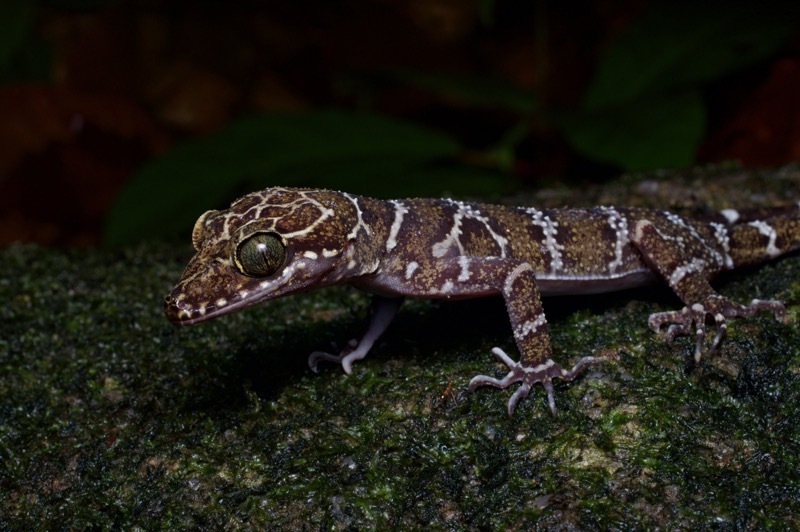 As you have come to expect if you've been following my Malaysia accounts, the most common gecko at Batang Kali was the so-called Four-striped Bent-toed Gecko. Some of these, according to the occasional photo, actually have four stripes. None of the ones I saw did. The other geckos we saw were much more interesting. 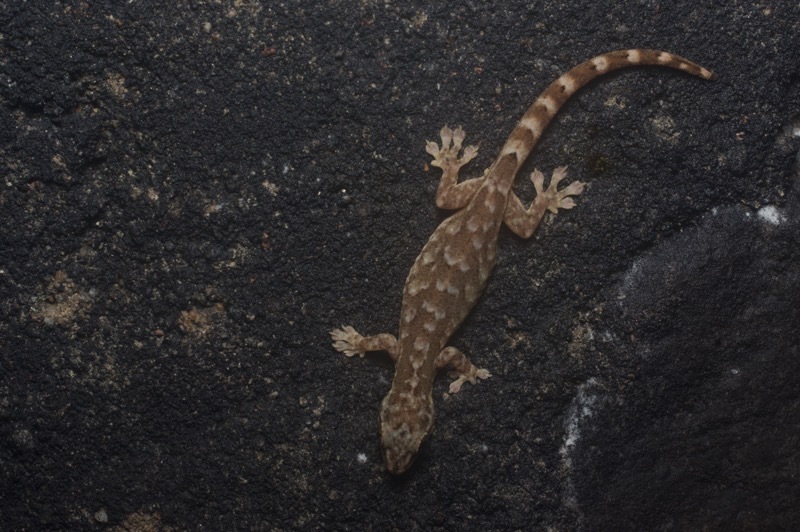 First we found one, then two, then several gorgeous Peters's Bent-toed Geckos. Here is a big adult. And here's a little one. The little ones have more contrasting patterns and are thus arguably even more beautiful. Those geckos were amazing, but the finest gecko of the evening had yet to come. 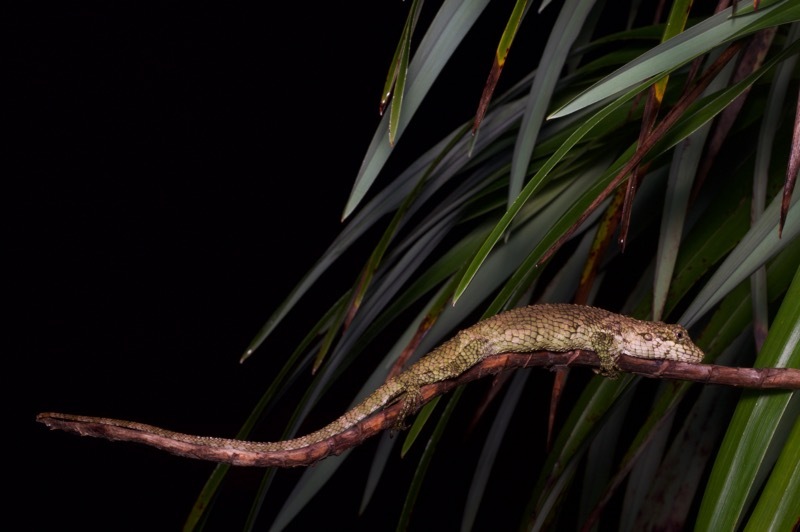 This is a monstrously huge Smith's Gecko or more descriptively Smith's Green-eyed Gecko or very accurately but prosaically Large Forest Gecko. Those eyes! We saw only one snake in the lowlands at Batang Kali. 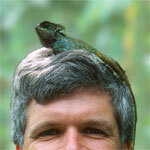 Kurt saw it coiled perhaps ten feet up in the foliage. Obviously a colubrid but we couldn't identify it clearly from this distance. Hey, that's a snake up there! 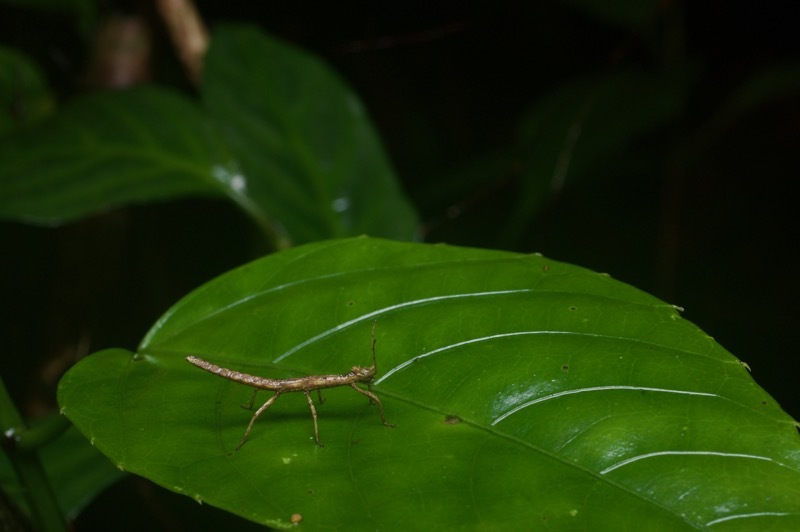 After procuring a sufficiently long stick, we managed to convince it to visit the forest floor. Then it was reasonably willing to hold a position on a lower branch. At this height Kurt could easily identify it. One afternoon, we were on our way to a trail lower than the highlands but higher than the lowlands when we came upon a fire truck pulled over and a couple of firefighters doing something at the side of the road. Hmm, we thought, what could they be doing? Something with a bag or pillow case? Kurt realized what was happening: "They're releasing a snake!" 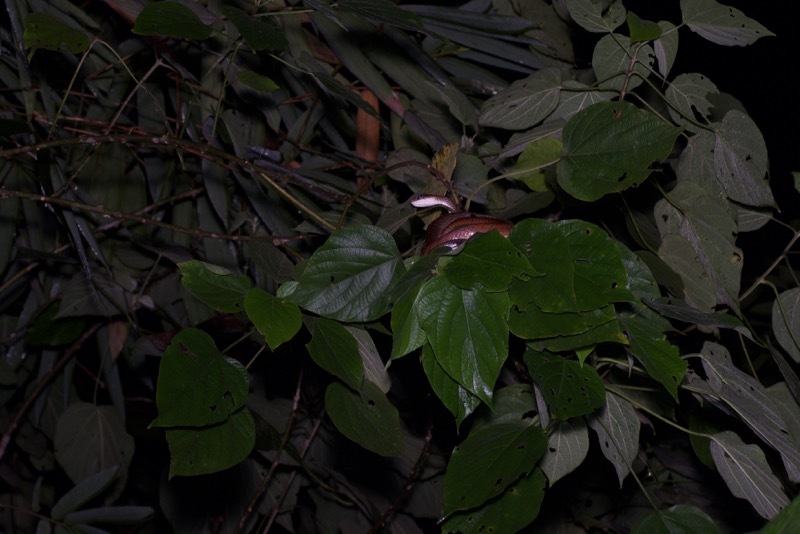 I saw that the snake was thick and green and therefore likely one of the green arboreal vipers. Kurt pulled over and I hopped out of the car to keep an eye on the snake, while he went over to chat with the firefighters. 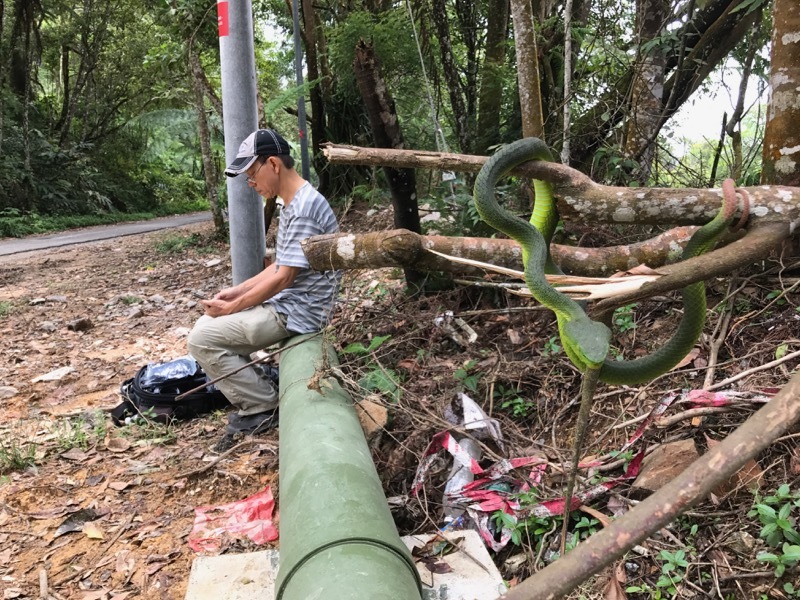 They told him that the viper had been on the grounds of a nearby Chinese temple, and they were relocating it on behalf of the temple occupants. Much respect to the firefighters and temple people for their humane approach. 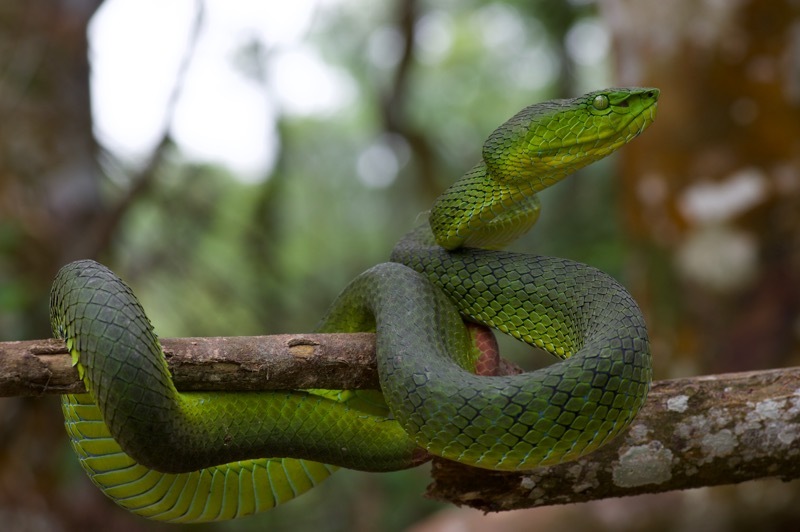 At first we weren't certain whether the snake was a Siamese Peninsula Pit Viper (Trimeresurus fucatus) or a Cameron Highlands Pit Viper (Trimeresurus nebularis). Kurt texted a snake expert to see if he could help us identify it, as the differences are subtle. 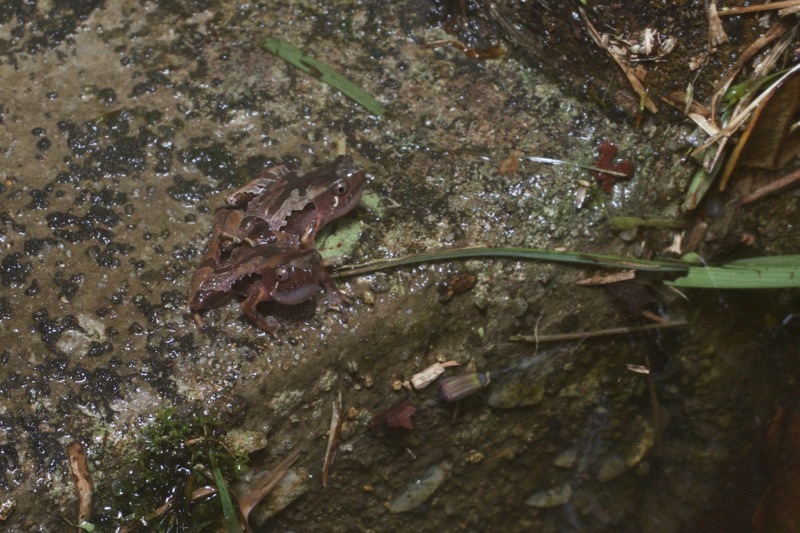 We eventually decided it had to be T. nebularis if only because the Chinese temple was at an elevation considerably higher than the known distribution of T. fucatus. 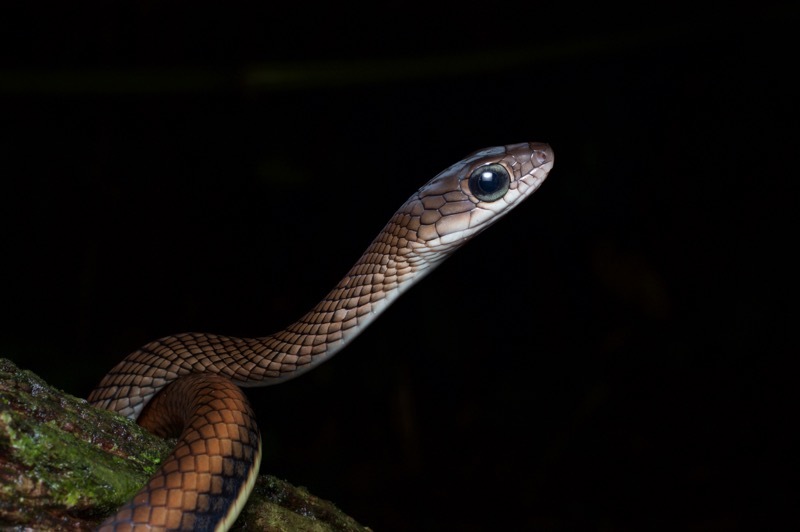 We also realized that the viper had been released at an elevation a few hundred meters lower than where it had been found. We both knew that studies had shown that snakes are unlikely to survive if released too far from where they were caught. Just the elevation difference alone could mean enough difference in microclimate to make life hard for our new green friend. So after it posed for some photos, we put it in a pillowcase, drove it back up the hill, and released it near (but not quite at) the temple. That's it for part 3. Next stop: Fraser's Hill.